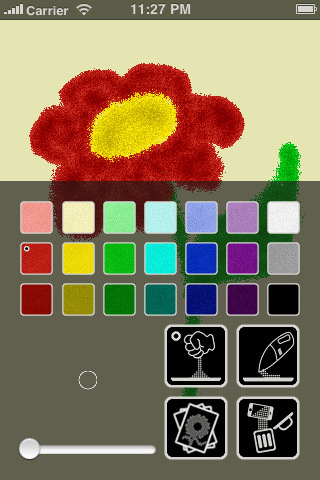 Sandpainting is an app that lets you make Sand paintings on your iPone and iPad. The format of Sandpainting is a lot like the classic Microsoft program Paint. It gives you a pallet of colors to choose from, two methods to apply color with, and a range of sizes for the stroke of your “sand.” Within the first few times of using the app it takes a while to adjust to the different widths and sizes of strokes you can make, but once you get the hang of it making identifiable shapes and objects is quite easy. The painting on the icon for this app is of two sand dunes rendered beautifully. I’ll say it probably takes a lot of expertise to create something that respectable, but for the every day artist or artist wannabe there is a lot of range and freedom to create something at least half as good. Whether or not you succeed at making a work of art, the process of painting is very enjoyable and relaxing. There is something to be said about moving your finger across the screen of your device and seeing clusters of color emerge and take shape. 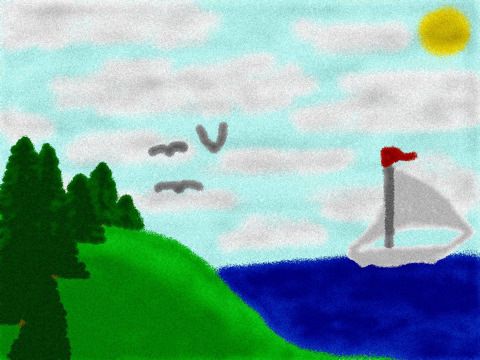 Beyond this it is nice to use an app that engages your imagination rather than relying on the imagination of others. I’d reccommend it for anyone with children, anyone whose dreams to go to art school were never realized, or anyone who simply appreciates the use of good colors. At just $0.99 cents you’re not exactly buying an entire art kit, but you can make works of art for very cheap and not have to worry about the clean up. Don’t worry about losing your masterpiece after its creation either–you can save each one when it’s done. Personally, I have mixed feelings about Technovelty Sweden’s iPhone, iPod Touch, and iPad app Sandpainting. The application itself is of good, sound quality, but the concept has me a little troubled. I can put my ethical problems with it aside, but first I must voice them: the art of sand painting is derived from Buddhists and Native Americans, among other cultures; to recreate it in an iPhone app almost seems a little sacrilegious. Be that as it may, all art forms tend to be modernized in one way or another, so I suppose it was only a matter of time before something like sand painting reached the app consumer. I am apprehensive to praise the re-appropriation of sand painting, but at least this application is made well. Update: Sandndpainting app, now even better. Customer feedback has been taken into account, new features has been added, performance has been improved. In short it’s the same app but even better. AppSafari review of Sandpainting was written by Renata Paszterko on September 16th, 2010 and categorized under App Store, Art, iPad apps, Universal, Utilities. Page viewed 5371 times, 1 so far today. Need help on using these apps? Please read the Help Page. I do understand your ethical concerns, this aspect was carefully considered before the development started and I do sincerely believe that it is good when culture gets translated into a modern medium, making it available for a larger audience and a new generation which probably would not have come in contact with the concept otherwise. Whether it was done in a good and dignified way is not for me to judge, but I did my best and the remarks about quality are greatly appreciated. There is an update which takes users feedback into consideration and improves quality further, just waiting for iOS 4.2 to be released.